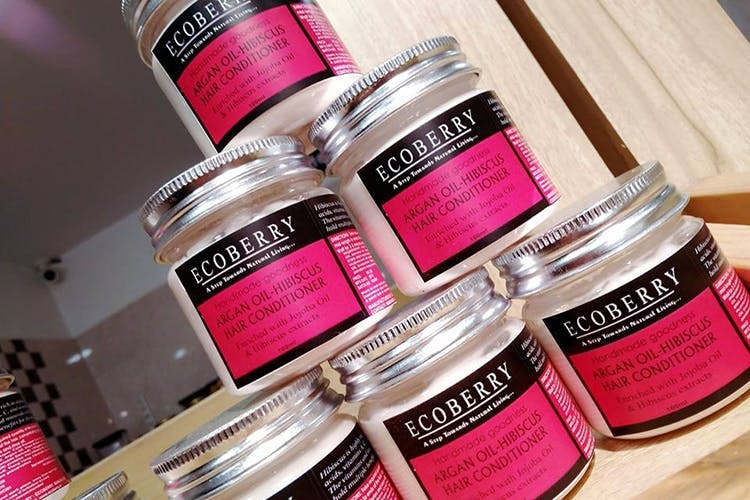 EcoBerry in Whitefield, the brand believes that beauty isn’t just skin deep as the store sells bath and body care products (for all genders and ages), all natural cosmetics and, natural ingredients that can be used as part of your beauty regime, or as part of your meal. Proving our mothers (and grandmothers) right, EcoBerry has gone back to basics, as most of their products are made from ingredients commonly found in our kitchens and gardens like gram flour, curry leaves, saffron, and the miracle plant Aloe Vera. While they have a range of skin and hair care products, they also have their own line of natural cosmetics including lipsticks, kaajal, BB creams and loose foundation powders specifically for Indian skin tones. Cream finish lipsticks, and lip balms and glosses good (and natural) enough to eat, as well as soaps and body scrubs that look and smell like dessert, it’s pretty clear that they believe what goes on our body is skin food.They also have a range for products that are suitable for going into our body like organic palm sugar, cold pressed nut and seed oils (for cooking, or application), flower and leaf powders (for those DIY self-care days) and essential oils. Should you have any questions regarding the ingredients, sourcing, and production process, the staff will be more than happy to explain everything to you, but if making the voyage to Whitefield (unless you live there of course) isn’t your cup of tea, you can order online on their website, and should you have specific requests, they take custom orders too. We noticed that some of the products that are available in the store aren’t online. Keep an eye on their Facebook page for flash deals and arrival of new products in smaller batches.